This property is presently on hold and no viewings are taking place. 1 Bdrm Grnd flr Timeshare Flat to sleep 4 (2 available), 1 for week 4, and 1 for weeks 5 & 6 (will sell separate weeks). Each comprise: Living rm. Bdrm. Kitch. Bathrm. Balcony/terrace. Air conditioning. Shared use of pool & leisure facilities. 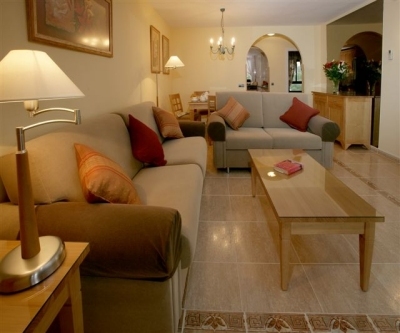 Price around £1,000 per each Timeshare week. Management charges £392. 31 per week. . Price around £1,000 Entry by arr. Viewing contact solicitors. This property is presently on hold and no viewings are taking place. We offer for sale TIME SHARE APARTMENTS (Sofia 103) in week 4 and (Laura 101) in weeks 5 and 6 of this prestigious resort in Calahonda, Malaga. All apartments have a balcony/terrace, sleep four and comprise lounge area with sofa bed, double bedroom with twin or double bed, fully fitted kitchen with dishwasher, fridge/freezer and microwave, and bathroom. The apartments have Satellite TV, telephone, safe deposit box and come with full linen and towels. All apartments have partial air-conditioning and there is an on-site laundry. 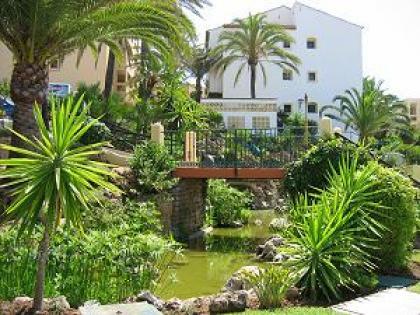 The sub-tropical gardens of Dona Lola Club are characterised by swaying palms and tumbling waterfalls - all gently sloping towards the sea with wonderful views out across the blue Mediterranean. A large resort built around a 270 foot long curved swimming pool, Dona Lola is situated within a short stroll of Calahonda with its shops, tapas bars, restaurants and nightlife. Most of the apartments at Dona Lola have south facing balconies or terraces. Bordering the spectacular outdoor pool is a welcoming bar and restaurant where regular entertainment includes a popular Flamenco show. In this area is a shallow pool for young children, while a second outdoor pool for adults completes the picture. For more informal dining, barbecues are weekly events during the summer months. The resort has magnificent leisure facilities including tennis courts, a heated indoor pool, gym, snooker and pool tables, sauna, whirlpool and Turkish bath. The health and relaxation centre offers a top quality service, including waxing, facials, hydromassage and Thalgo marine treatments. ON SITE AMENITIES: Satellite TV. Telephone. Safe Deposit Box. Full Linen and Towels. Fully Fitted Kitchen with Dishwasher. Fridge / Freezer and Microwave. Balcony or Terrace. All apartments have partial air conditioning. Gymnasium. Health & Relaxation. Leisure Club. Snooker & Pool. Tennis. Children's Activity Programme. Bar Brass Restaurant. Children's Play Area. WEEK 4 - 2010 - 23/01; 2011 - 22/01; 2012 - 28/01. WEEK 5 - 2010 - 30/01; 2011 - 29/01; 2012 - 04/02. NOTE: This property is presently on hold and no viewings are taking place.